The best thing to do while in Punta Arenas is to visit Isla Magdalena. This uninhabited island in the Strait of Magellan is Chile’s most important Magellanic penguin colony and one of the best places in the world to see penguins outside of Antarctica. Every summer from November to March, Isla Magdalena is home to more than 120 000 Magellanic penguins who come to the island to mate, lay eggs, and raise their chicks. The number of penguins on Isla Magdalena has steadily been increasing ever since the Chilean government banned commercial fishing nearby. The island is so important that it is even a Natural Monument! It is also known as Monumento Natural Los Pingüinos. The penguins migrate to Isla Magdalena by swimming down from Southern Brazil and the Peruvian coast. They come because they need a lot of light during the breeding season. At Isla Magdalena’s latitude, the penguins enjoy up to 18 hours of sunlight per day! The Magellanic penguin is a small penguin – about two feet tall. Its closest relatives are the Galapagos penguin, the African penguin and the Humboldt penguin. It is named after the famous explorer Ferdinand Magellan, who first spotted the penguins in 1520. Magellanic penguins are expert divers and feed on crustaceans, krill, squid and small fish. During your visit to Isla Magdalena you will see penguins swimming and diving off the beach. One special thing about Magellanic penguins is that they mate with the same partner every year. Starting in September of every year, the males return to the burrow they used the year before and wait for their mate to return. Females recognize their mate from their unique call. Both males and females play an equal role in feeding and raising their chicks. Solo Expediciones offers daily departures to Isla Magdalena from October 1, 2018 to April 5, 2019 (except for December 25 and January 1). The price is 63 000 CLP and you can pay by cash or credit card in the office. Before arriving in Punta Arenas in early November, I reserved my spot on the morning Isla Magdalena Penguin Tour by filling out the reservation form on Solo Expediciones‘ website. However, my flight to Punta Arenas to Santiago was overbooked and I did not arrive until the next day! So soon after checking into my hotel, I walked to the Solo Expediciones agency in downtown Punta Arenas. There was a long lineup of tourists who were paying for the afternoon tour or checking if there were last-minute spots available. I lined up behind them, eager to find out if there was space on the morning tour the following day. Several tourists were turned away as the afternoon tour was full. I began to get nervous, afraid that I might not get the chance to take the morning tour. A friendly man in the agency, who later turned out to be the bus driver, smiled at me encouragingly and said “Suerte!” (Good luck!). When I finally reached the front of the queue, I asked the lady at the desk if there was space on the morning tour the next day. She frowned and shook her head. “I don’t think so”. My heart dropped! “Wait a moment…I will check again”. She flipped through her list of reservations quickly before she said “Yes!” She took my name and passport information and told me to come back to the agency at 6:30 am the next morning to pay. 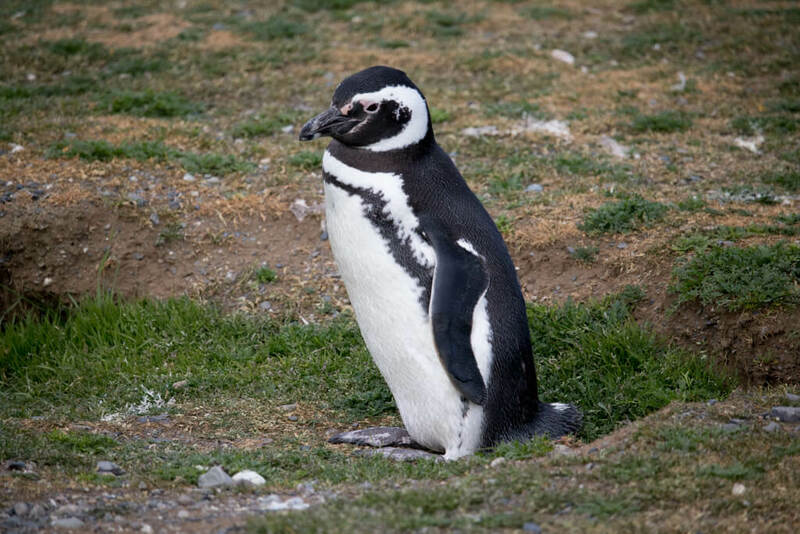 Since the Isla Magdalena Penguin Tour is so popular, I highly recommend you make reservations online in advance or at least visit the agency the day before. As the winds in the Strait of Magellan are often very strong and cause the tour to be cancelled, consider staying a few days in Punta Arenas so that you will have another chance to take the tour if it is cancelled. The next morning, after about a 30 minute drive from the Solo Expediciones office, the bus dropped us off at Tres Puentes terminal where two boats were waiting. We were split into two groups to board the boats. One was orange and the other one was bright yellow. Each group put on different-colored life jackets so that they wouldn’t get on the wrong boat later. I ended up on the Isla Isabel, the yellow boat. As the Isla Isabel sped away from the dock, the two Solo Expediciones guides took turns giving explanations in Spanish and English about the penguins and other wildlife in the area, showing drawings in guidebooks. They also explained the geography of the area, pointing out our location on the map. After about 40 minutes of sailing, the boat slowed down to circumnavigate Isla Marta, an island full of sea lions and birds. The sea lions were huge and noisy! Groups of tourists took turns observing and taking photos of the sea lions from the front of the boat. The boat continued moving towards Isla Magdalena. Finally we disembarked. I was eager to see the penguins. The guides told us that we could take off our life jackets while we walked around the island but most people opted to keep them on as it was extremely windy and chilly. We were given less than one hour on the island (this is the time limit for all visitors in order to protect the wildlife) to walk along the path and observe the penguins. Soon after disembarking I saw my first penguins splashing in the waters off the beach towards my left. As I was walking along the path, sometimes a penguin or two would waddle across the path in front of people. Whenever that happened, the guide would tell people to stand still and allow the penguin to cross before continuing to walk. The penguins have no fear of people! Some penguins were curled up in their burrows, taking shelter from the high winds or nesting. Others stood looking around or cleaning their feathers. About halfway along the path, there is a lighthouse. As Southern Chile has dangerous and rough waterways, the lighthouse was built in 1902 for Chile’s Navy to guard the coast. Today the lighthouse is used by the people who manage the penguin colony. Inside there is a small exhibition and you can actually climb up to the tower for views of the island, but no one from my group did that. With such limited time, it is better to skip the tower and just enjoy looking at the penguins. After visiting the island, we were offered cookies, tea, and coffee aboard the boat. However, as the ride was extremely rough on the way back, the guides advised people who get seasick easily not to eat anything. As the boat bounced over the waves, the crew played the song “Yellow Submarine” over the speakers. As Punta Arenas is located directly under the hole in the Earth’s ozone layer, UV protection is extremely important, even on cloudy days. Wear a sunscreen of at least SPF 50+ on exposed skin. SunBum is a reliable brand. A DSLR camera would be best for taking high-quality shots of the penguins. I have been using the Canon EOS Rebel T6i for several years and it still works very well. It has built-in wifi so you can easily transfer your photos to your phone using an app. As you are not allowed to approach the penguins, a 55- 250 mm lens will help you zoom in on them and get excellent shots. Although there will be penguins nearby that you can see easily without binoculars, you might want to zoom in on penguins that are far away. Binoculars would also be useful for spotting other birds on Isla Magdalena as well as watching sea lions on Isla Marta from the boat. As it can get very windy on Isla Magdalena (up to 100km/h), bring a winter coat, hat, gloves and wear thick socks and sturdy boots or walking shoes. Love your photos! Never thought about setting penguins in Chili! Such a variety of landscapes and things to do there! Oh these penguins are just adorable, I would love to do this one day, I had no idea that you could do this in Chile! Thanks for sharing. I love penguins!!! I’ve seen them in Argentina in various places and in South Africa. You should watch the latest BBC documentary Dynasties, the chapter about Emperor Penguins. My husband LOVES penguins, so he is going to flip out when I tell him this is a thing! It’s so dumb, because you OBVIOUSLY went on the tour, but reading the beginning I was genuinely thinking, ‘Oh no! What if she doesn’t get to see the penguins!’ Glad there was a space, it would have been a shame to go all that way and not see them. Your photos are great, they really capture their playfulness. What an incredible experience! I love those little guys, so cute. Great visitors’ tips—especially about the UV situation and the need to bring sunscreen. I’ve found the sun in South America is so much stronger than anywhere else I’ve travelled. I just love penguins and I would love to see those on Isla Magdalena! They are just too cute! And I love the what-to-bring things! So good to know! I’m planning a trip to Chile and really want to do the penguin tour when I am there. Thanks for all the information!